British Transport Police (BTP) have confirmed that a man has died after being hit by a train in Wakefield last night (Friday). The incident happened at around 7.50pm between Horbury junction and Wakefield Westgate. BTP attended the scene - near the Monkton Road Industrial Estate - with paramedics, but found the man was dead when they arrived. Officers say they are not treating the man’s death as suspicious. A BTP spokesperson: “At 7.50pm on Friday, June 12, 2015, a report was received that the driver of the 7.06pm Sheffield to Leeds passenger train reported striking a person between Horbury junction and Wakefield Westgate. “Police officers together with paramedics attended the scene and the body of a male person was found. No further details are being released about the man at this stage. 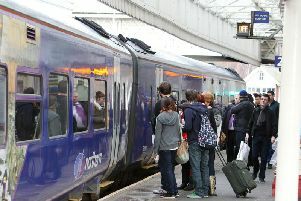 The incident caused major disruption for commuters, with trains between Leeds and Sheffield being cancelled for several hours.